A handicape can become an advantage ... especially when it comes to football! Africa Animated! is a series of hands-on training courses for the production of African children's animated cartoons. Its main objective is to provide high quality African animation programmes for regional Anglophone and Francophone countries. 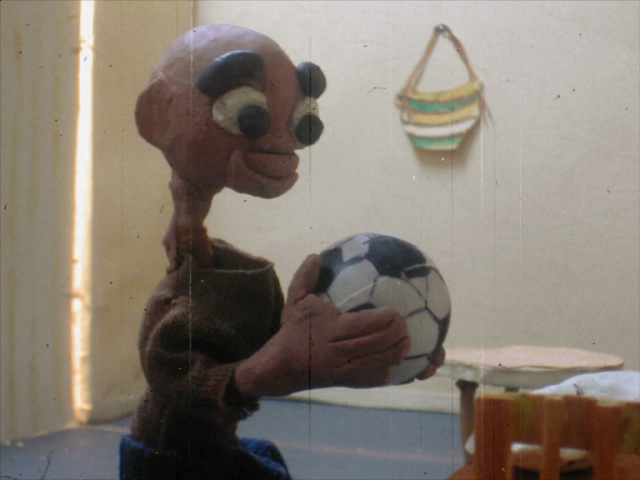 The short animated films on this reel are the outcome of the first hands-on training workshop held from June 28th-July 30th, 2004 in Zanzibar and Nairobi. Following a first introductory week at the Zanzibar International Film Festival aiming to encourage the interaction with the regional audiovisual community, the group moved to Nairobi's Kenya College of Communications Technology for four weeks of training and production. 15 participants from Kenya, Uganda and Tanzania were trained in animation techniques. The trainees developed their own stories addressing issues of relevance to African children and consequentely based on these stories. Students from the Mohamed Amin Foundation Media School in Nairobi added the sound and music effects, completing this 100% African production. Authors and personalities: Alfred Muchilwa, author ; Samuel 'Tuf' Mulokwa, author. Production: UNESCO Communication and Information Sector, Programme for Creative Content, producer.Canal France international, sponsor ; UNICEF, sponsor ; Kenya Television Network, sponsor ; French Cooperation, sponsor.